I can’t believe that I’m finishing of a series for once. 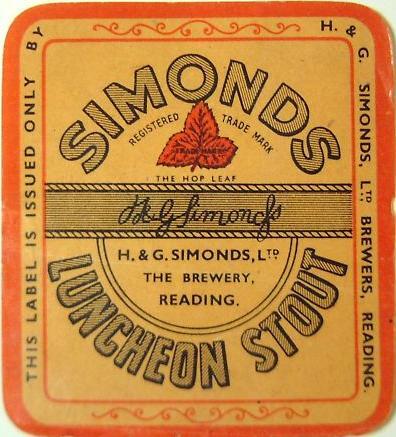 The series in question being the beers of H & G Simonds 1945 to 1960. I’ve no real way of knowing which brewery these beers were made in. Assuming Reading would be very dangerous. From labels I’ve seen, I know that some brands, such as Berry Brown Ale, were brewed elsewhere. During this period they had at least four breweries in operation, though exactly which breweries varied, as some were closed and others purchased. Simonds seem to have brewed three Stouts, in ascending order of strength Luncheon Stout, Special / Velvet Stout and Archangel Stout. It’s a reminder that Stout was still an important niche for British brewers and Guinness hadn’t hoovered up all the trade. Luncheon Stout appeared in the second half of the 19th century. It was the Stout equivalent of a Light Dinner Ale, that is a relatively low-gravity beer sold without ageing. They were also specifically brewed as bottled beers. As the name implies, it was a light beer intended as an accompaniment to a meal. The first mention I can find of Luncheon Stout is from 1889 price list, which has examples from Allsopp and Foster, a London brewer. Both are priced at 2.5d per Imperial pint, which implies an OG of 1045-1050º. Er, can I try that again? I’ve just found an analysis of Allsopp’s Luncheon Stout from 1896. It had a gravity of 1063º and an ABV of 6.7%*. Examples from between the wars had OGs of around 1040º. The level of attenuation varies a lot between the three samples, as does the ABV, despite the OG being fairly constant. None is particularly alcoholic, two barely intoxicating at all. Next up the tree Special/Velvet Stout (I assume it’s the same beer with a name change in the early 1950’s. It manages to have even worse attenuation than Luncheon Stout, on a couple of occasions dropping below 50%. Meaning it struggles to get much over 3% ABV despite an OG in the high 1040’s. Pretty poor value for money and doubtless pretty sweet. Finally Archangel Stout, which has the gravity of an Imperial Stout. If not the ABV. It’s another very poorly attenuated beer. I think I’m beginning to see a theme here. With a finishing gravity over 1040º it must have been thick and sweet. Perfect for the arctic. * Wahl & Henius, pages 823-830. Dear stuff, that Archangel Stout - four bob a pint! Must have been sold by the nip. Beer history is so strange - just about everything seems to have changed, in a relatively short period of time.